Are you finding choosing a wedding photographer a bit tricky? Don’t know where to start? Don’t worry…we can help you to find the best wedding photographer for your special day. As well as asking your photographer questions about their work, make sure you also ask yourself some basics, such as, ‘What style of photography do I like?’ It’s much easier to spot what you want when you know what you’re looking for. But if you’re not much of a photography buff, take the time to check out the different wedding photography styles below to see if something catches your eye. Obviously one of the best ways to choose a photographer is by looking through a portfolio of previous wedding photoshoots. While there may be a certain sameness, a talented and experienced wedding photographer will be able to capture and work with the emotions of the day so that your wedding photos represent your day and not just ‘another wedding’. Image: Maddie Manning Photography – A beautiful candid shot of Luke and Belinda's wedding held at Pialligo Estate. You don’t need to be best buddies, but you do want to establish a personal rapport to ensure you feel comfortable with each other. While most wedding photographers are experts at capturing those close-up shots without getting ‘in your face’, they still are with you for a large portion of your day. From your getting ready shots, your arrival, ceremony, location photoshoot after the ceremony, and often the wedding reception - you can see why you would want to have someone whom you feel comfortable with and who can reflect your style. Image: Maddie Manning Photography – Being able to 'be yourself' in the company of your photographer helps to capture those precious moments. Image: A Shot Above the Rest Photography - Getting ready shots. Costs vary between photographers and most often, the extra expense can be attributed to a photographer’s expertise. Experience counts for a lot and shouldn’t be underestimated. The experienced wedding photographer knows when to get that special shot or what to look for to capture the emotion of your special day. Their special effects, lighting and superior equipment will enhance your photos to provide you with quality images. Photographers offer many different packages from digital prints to designer albums, and with the inclusion of drones now becoming a ‘thing’ with weddings, you would expect to pay a bit more. 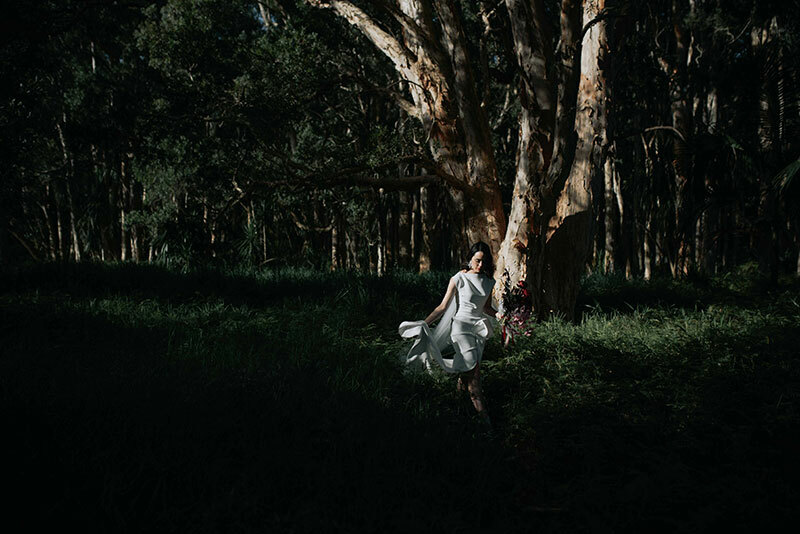 Image: ACT Capital Photography – Nikiya and David in Country NSW - We love the way the gown is illuminated by the light in this beautiful photo. Usually between 4-8 weeks would be expected to receive your photos. It very much depends on your package though, so make sure you ask this question when you book in your photographer. WHEN DO I BOOK MY WEDDING PHOTOGRAPHER? The consensus seems to be no less than 9 months before your wedding date, though some popular Photographers may need to be booked much more in advance of your wedding. HOW MANY PHOTOGRAPHS SHOULD A WEDDING PHOTOGRAPHER GIVE YOU? When it comes to how many photos you should receive, it really depends on the package you have agreed to with your photographer. When hiring your wedding photographer, make sure you both understand exactly what is expected of your arrangement. Most photographers will have a contract which lists everything and which you will be required to sign. Don’t assume anything, if you aren’t quite sure on any details, for example copyright of your photos, cancellation policy etc., it’s important to speak up and have your concerns answered and added to the contract if necessary. Everyone is familiar with Traditional styled wedding shots. Formal, posed photos were once popular, but have now taken a backseat to more candid style shots. The traditional photos of your wedding party and family are still taken, but in more casual poses and settings. Image: A Shot Above the Rest Photography – A little bit posed but much more casual than a traditional wedding photo. We love the light, airy atmosphere in this shot. Image: All Grown Up Weddings – A classic photo with the bride, groom and their wedding party in a row, but with a relaxed vibe - not too formal or stiff. Image: All Grown Up Weddings – We love the fusion of a traditional wedding subject with a candid style shot. The bride and groom are in a formal pose but the bridal party's movement adds interest and gives it a modern vibe. Also called documentary photography, photojournalistic photography is increasingly popular nowadays. These candid style shots are taken while the subject is unaware (or at least they act like they are unaware). No posing, more informal and more emotive than the traditional style of wedding photography. Image: Indigo Images - Ellen and Aaron – A happy, relaxed feeling is captured in this candid shot. These images are strongly emotive, with the use of light and dark to create moody or airy shots. Atmospheric shots fit into this space, as do photos such as smoke bomb shots, moody shots at dusk or dawn, and photos of dark cloudy skies. These are photos which are intended to be appreciated as visual art. If your attention to detail in the design and decor of your wedding is extremely important to you, then fine art wedding photography may be the perfect match. And if you love a bit of drama, this style is a definite winner. Image: Thorson Photography – A touch of drama in this artistic shot of Martin & Elysia using light and smoke bombs. Old and timeless, Vintage wedding photography is a popular style. It goes perfectly with a rustic styled theme which is so popular with the retro-loving crowd. Image: Thorson Photography – Alana & Steve at Parlour. If you're still searching for a Wedding Photographer, our wedding expos showcase quality photographers. They provide the perfect opportunity to meet a variety of photographers in person and view their portfolios on the day.